Motto: "A Place With Roots"
Roxborough is a neighborhood in the Northwest section of the city of Philadelphia, Pennsylvania. It is bordered to the southwest, along the Schuylkill River, by the neighborhood of Manayunk, along the northeast by the Wissahickon Creek section of Fairmount Park, and to the southeast by the neighborhood of East Falls. Beyond Roxborough to the northwest is Montgomery County. Roxborough's zip code is 19128. 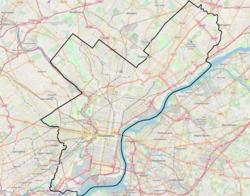 Most of Roxborough is in Philadelphia's 21st Ward. Most of modern-day Roxborough was once part of Roxborough Township, which was incorporated into the City of Philadelphia following the passage of the Act of Consolidation, 1854. At this time Roxborough was the home of the area's wealthiest; the owners of the Manayunk mills. These textile mills produced revenue that was spent building schools, parks, and a large Victorian manor built for the area's elderly women, The Roxborough Home for Women. Since the 1950s, most of Philadelphia's major television and FM radio stations have located their transmission towers in Roxborough because of its hilly terrain and high elevation. Public television station "MiND", once called "WYBE", was also formerly located in Upper Roxborough, close to neighboring Andorra. The Upper Roxborough Historic District and William Levering School are listed on the National Register of Historic Places. Roxborough is well-connected to Center City Philadelphia with multiple bus routes and bike lanes reaching the river and downtown area of Philadelphia. SEPTA's Manayunk/Norristown Regional Rail line stops in the Wissahickon section of Roxborough, continues through Manayunk, and stops again at the Ivy Ridge station in Roxborough. Philadelphia University and St. Joseph's University are nearby. Henry Avenue runs parallel to Ridge Avenue from the border of East Falls and North Philadelphia, to Andorra where it merges into Ridge Avenue. Constructed in the 1930s, it was extended in 1959 from Roxborough Avenue to Andorra, and includes several concrete arch bridges. One of these bridges, the Wissahickon Memorial Bridge which crosses over the Wissahickon Creek and Lincoln Drive, includes a pair of box tunnels under the roadway designed to carry a never built extension of the Broad Street Subway into Roxborough. Because of the Wissahickon Creek and the park which protects much of its watershed, Roxborough and Manayunk are physically separated from the rest of the city. Much of lower Roxborough, consisting of "row homes" and homes dating from the 19th and early 20th centuries, has a historic, urban character. Roxborough abuts the Wissahickon Valley Park portion of the Fairmount Park system. The park's numerous trails are used by cyclists, runners, walkers, dog owners and mountain bikers. The north-west section of Roxborough is often considered a separate neighborhood called Upper Roxborough. Much of the development in this area occurred after 1950, and has a suburban character: larger front lawns, garages, and shopping centers. The area of Roxborough was likely named for Roxburghshire, Scotland, the original home of Andrew Robeson, one of the very first settlers of the area. In 1676, Andrew Robeson, his wife Elizabeth, and his nephew Andrew Jr. came to America from Scotland where Andrew Sr. became Surveyor General for 300,000 acres of land in Southern New Jersey where he presided as Judge in Gloucester County. In 1690, Andrew Sr. moved to Philadelphia and purchased an estate located in the area that is known today as Roxborough, roughly where the on and off ramps for City Line Avenue and Lincoln Drive are. Andrew Sr. became Chief of Justice in Pennsylvania until he died in 1694. He was responsible for making Roxborough a township in 1690. The Robeson family is known to have originally come from Kelso, Roxburghshire, Scotland. Roxburgh (pronounced Rocs-burr-ah) was a small region in the southeast of Scotland until it was changed to the region of "The Borders" in 1975; the town of Kelso still remains as a historic Scottish village though. In 1706, a German philosopher named Johannes Kelpius who lived in the woods not far from the Robesons wrote about "foxes burrowing in rocks" in the area. A correlation between the phonetic spelling "Rocksburrow" that many resident Germans applied to the Township, and Kelpius's "where foxes burrow" letter of 1706, convinced many that the township's origins related to foxes. Kelpius popularized his spelling of the township, but not long afterward, the spelling was changed to its current form. The Township could have retained The names "Manatawna" or "Leverington", as they were popular names the area was referred to as in the 1690s and early 1700s, but thanks to the popular writings of Johannes Kelpius, the name remained as Roxborough. Other spellings have also been noted in early writings as Roxbury and Roxboro. School District of Philadelphia operates public schools. Its zoned schools include Shawmont Elementary, Cook Wissahickon, and Roxborough High School. The Walter Biddle Saul High School of Agricultural Sciences and Lankenau Environmental Magnet High School are in upper Roxborough. William Levering School, founded in 1748, closed its doors in June 2012. Its building will hold a different school, AMY Northwest, a special admissions middle school (6-8). AMY used to be located in the Mount Airy section of Philadelphia, in a rented church building. The area has been one of the main feeder regions for Roman Catholic and J.W. Hallahan High Schools. Free Library of Philadelphia operates the Roxborough Branch at 6245 Ridge Avenue at Hermitage Street. The "Roxborough - Manayunk - Wissahickon - East Falls - Andorra Historical Society" also has an archive room in the Roxborough Branch. It is maintained by one of the Historical Societies' top members and one of the area's community leaders, Sylvia Myers. ^ "Our History." W. B. Saul High School. Retrieved on March 28, 2013. ^ DeNardo, Mike. "Philadelphia School Reform Commission Votes To Close Seven Schools, Adopts Preliminary Budget". CBS Local Media. Retrieved 6 December 2012. ^ Scavuzzo, Sam. "SRC Votes to Close Levering Elementary". Roxborough Patch. Retrieved 6 December 2012. Wikimedia Commons has media related to Roxborough, Philadelphia. Binzen, Peter. Whitetown, U.S.A.. Random House, New York, N.Y., 1970. This page was last edited on 27 March 2019, at 17:04 (UTC).